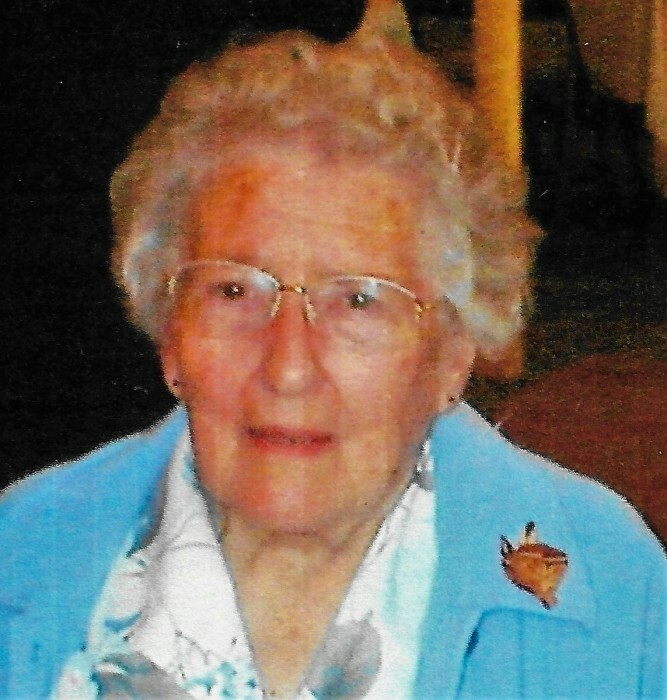 June Hedberg passed away January 19, 2019 at Crestview Health Care. She was born June 1, 1919 in Oak Park, Illinois to Frederic and Ethel Radtke. She attended school in Oak Park and graduated from West Proviso High School. She married Dan “Bus” Hedberg in 1940. She worked as a secretary until her first child named June was born. She found out that the United States had entered WWII when her sister called after the child's baptism. A second daughter was born, Dianne. While June's sister worked to support the war effort, June stayed home to baby sit her sister's children. She was very good at dealing with the rationing imposed by the shortages in the war. Dan decided that he should be a farmer. His uncle had a large farm in Blue Hill, NE so the little family moved to an old two story farm house about 7 miles from Blue Hill. June went from the suburbs of Chicago to the undeveloped farm country of Nebraska. The house had no electricity, no REA yet, no water, there was a windmill across the road, and an out house in the back yard. Heat was provided by cast iron stoves burning corn cobs. Woe to the girls if they brought in wet corn cobs. June did get to move her piano with her, one of the few amenities she still had. She was an accomplished pianist. Farm houses were usually a mile apart on the section lines. Many nights the neighbors came over for a big sing along with June providing the piano music. Her introduction to country living was the Blizzard of '49. The family was snowed in for two weeks until the neighborhood men got together a tractor convoy and broke through the drifts the 7 miles to Blue Hill where they gathered up essential items to bring back. June had a big garden and canned a lot of the produce. She also had chickens and eggs. She made the most of life on the farm. When June's sister died, the family had to move back to Illinois so she could take care of her sister's 3 boys. It was the first time that her daughters had seen TV. They stayed in Illinois until 1952. Dan got a job as a diesel mechanic for the railroad in Chadron. June worked for Jack Hawley, the vet when they moved to Chadron. Later she took a job in the treasurer's office. After renting for years, they decided to buy a house. They found the home they wanted in Whitney. When Dan retired from the rail road June decided that 18 years as deputy county treasurer was enough so she retired also. She now had free time to do the things she loved. June loved her flowers. Her peonies were her pride and joy as was the perennial sweet pea. She spent hours in her flower beds making them just so. She was an accomplished knitter and made many wool sweaters for friends and family. Another of her loves was camping. She and Dan and what ever dog they had went camping in the Hills and also to DuBois, WY. The DuBois trips were sometimes made with grandsons along. June and Dan collected many types of rocks on their trips along with making many new friends. June would proudly wear the jewelry pieces that Dan made from the rocks they found. They spent many weekend days in pursuit of the elusive Fairburn agates. June loved the dogs she and Dan had, the corgi and the Airedale terriers. Her favorite was Candy a little rescue dog they brought home in their later years. June is survived by her daughters, June Johnston and Dianne Dhooge and grand sons Stan Stenson, Sean Stenson and Dan Bolster. She was preceded in death by her husband Dan. June crossed the Rainbow bridge on January 19 to meet the dogs that had gone before her. She and the dogs walked together to meet Dan. If there are Fairburn agates in Heaven, she, Dan and the dogs are out looking for them. A memorial has been established for the Chadron and Crawford Volunteer Fire and Rescue Departments, or the Immanuel Lutheran Church in Chadron. Donations may be sent to Chamberlain Chapel, PO Box 970, Chadron, NE 69337.